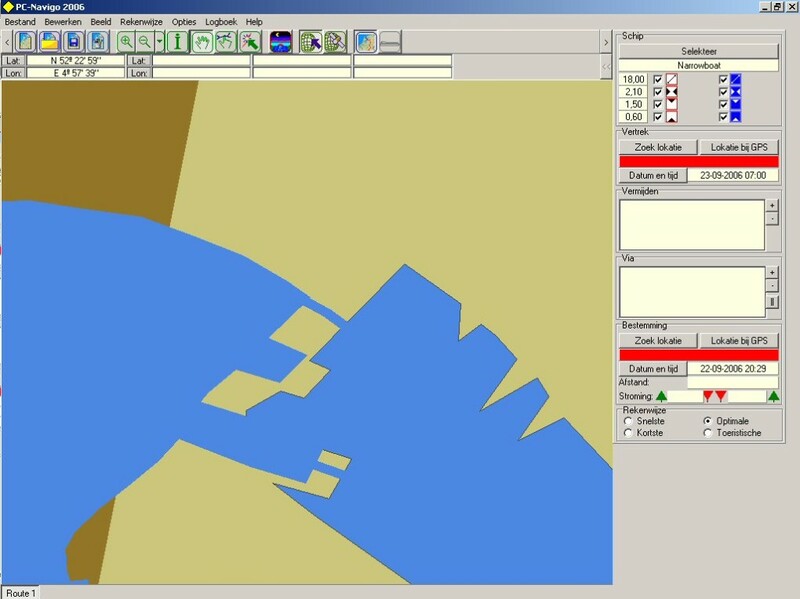 PC-Navigo is originally a Voyage Planner for the inland waterways of Europe. 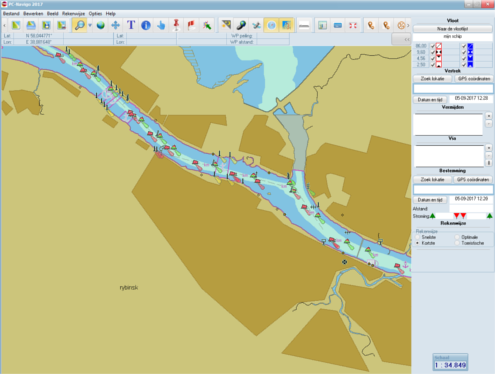 But apart from all functionalities that allow the computer to plan and analyse a voyage, PC-Navigo now also contains a so called Inland ECDIS chart viewer. The charts that can be made visible are so called ENC (Electronic Navigation Chart) which contain a huge amount of detail, up to the colour and shape of buoys and beacons and the position of the navigable channel. When used for planning and logistical purposes, PC-Navigo doesn’t need so much detail, of course: it’s enough to know where a vessel can pass and when it can pass. That information has to be available over a large range, in order to plan from departure point to destination, but details like buoys, lights and channel depths are of little importance. But when used as an aid to navigation, the near-by details are just as important as the long distance data or perhaps even more important: in such a situation, the ENC viewer provides the exact chart image, including buoys and beacons, lights and dangers, lock chambres and pontoons, thus allowing a safe and secure navigation. At the left you see a chart screen picture of the “planning mode” of PC-Navigo (if you click on the image, it will be enlarged). Sailing from the Lek River into the Merwede Canal the junction at Nieuwegein is visible. There is not an awful lot of detail, although the contours of the river will more or less show the meanders. 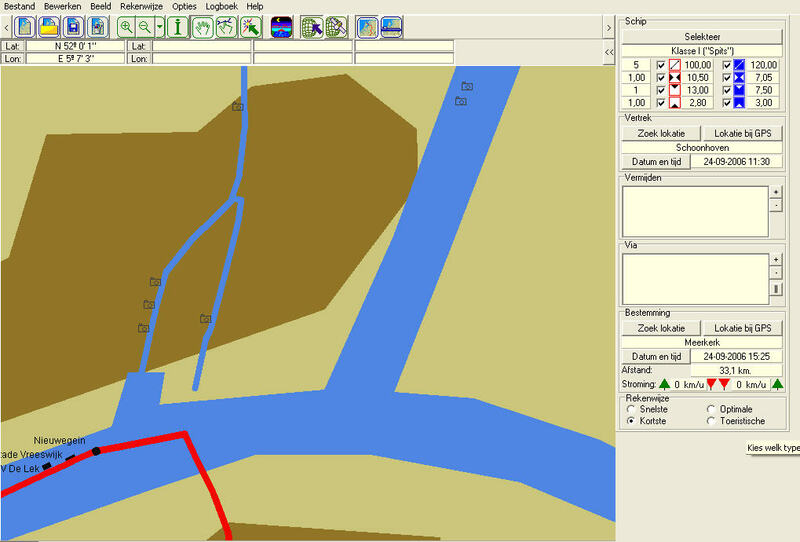 The voyage planning functionality does not require more: as long as the GPS position will determine the vessel’s position somewhere near the river contour, the computer is perfectly able to calculate the necessary (long) distances. 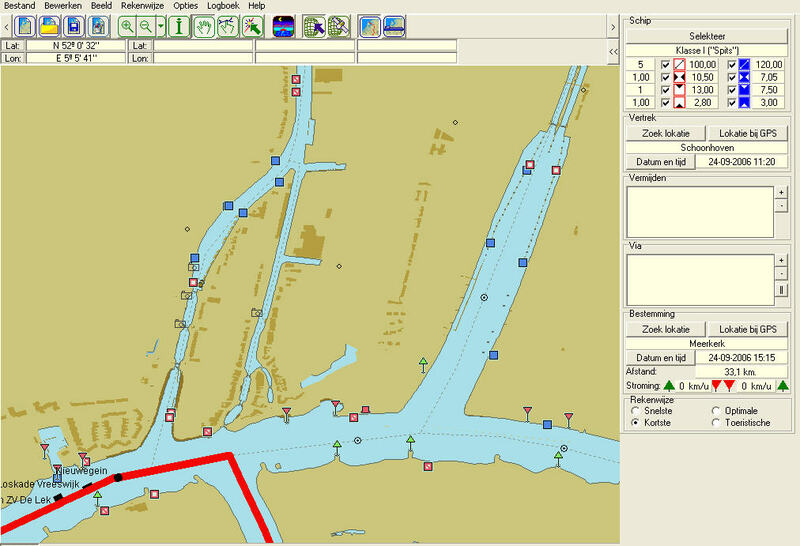 In the second image you see the same junction, but now in an official navigation chart of Rijkswaterstaat, presented by PC-Navigo in “navigation mode”. 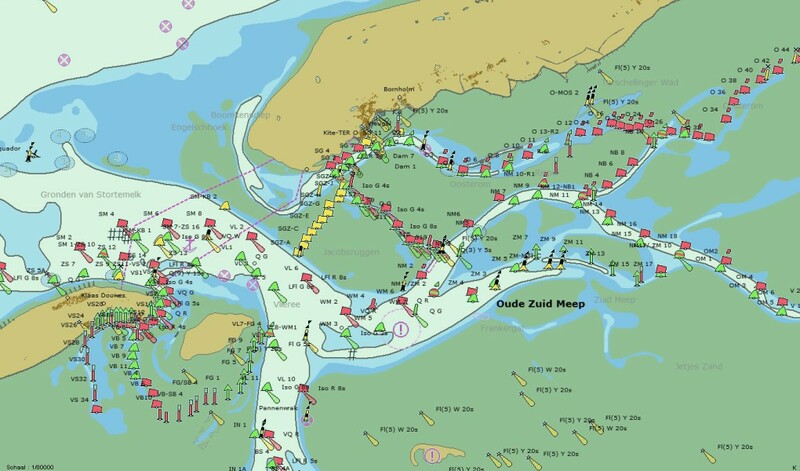 The chart image is compiled by means of the official ENC’s (Electronic Nautical Charts) and all features that have an impact on the navigation are show in great detail, including buoys, beacons, traffic signs and marks, and constructions. The navigable channel and everything in it is show with a remarkable accuracy, and by means of a GPS reliable navigation conclusions can be drawn from the chart. If you consult PC-Navigo for matters that involve a larger area (e.g. if you want to plan a voyage to Budapest) then this detailed chart presentation is useless: the computer would not be able to handle all the details simultaneously. The voyage planning software in PC-Navigo, however, will “step back” to an overview level that allows it to perform the long distance planning task first. As soon as this task is done and the user zooms in to a certain level of detail, the overview charts are replaced by the detailed and accurate ENC’s (if these are available for the concerned area!). Thus the combination of PLANNING and LOGISTICS for the long term decisions and NAVIGATION and MANOEUVRING for the short term decisions of the skipper is facilitated. The change from one type of chart to the other works fully automatic in PC-Navigo. Another example from PC-Navigo, the Oranje Locks near Amsterdam: without the ENC information this area looks like the first image on the right. With the additional ENC information the same area looks as shown on the right. If you navigate with the help of a Global Positioning System (GPS) the difference is even more important. The GPS can show the position of the vessel accurately, but in order to define this position in a chart, this chart has to be at least as accurate. Not only the relative distances must be as accurate as possible, but also the absolute position expressed in latitude and longitude of each and every object. If this would not be the case, the GPS position of the ship in the chart would lead to the wrong conclusions as for the vessel’s real position. It’s obvious that the overview (planning mode) charts of PC-Navigo could never reach this precision. The ENC’s, however, can guarantee an accuracy within a range of only a few meters. 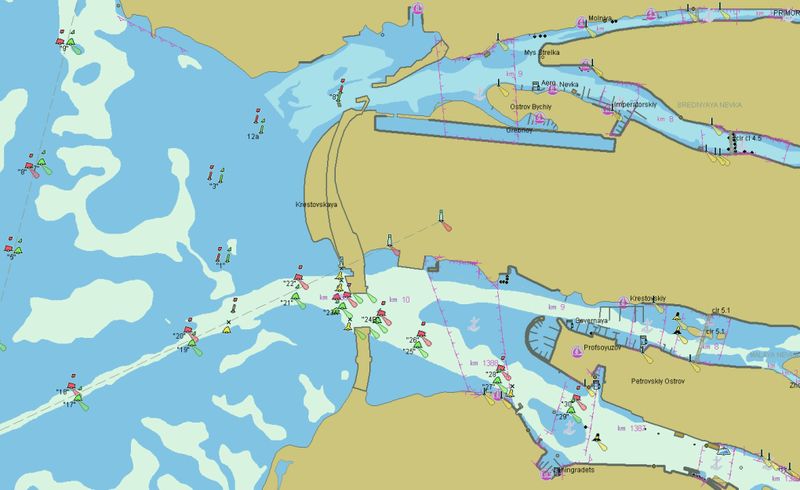 Inland ECDIS charts (ENC’s) are part of the European Union’s “River Information Services” approach: national waterway authorities are obliged to make these charts available for all waterways of class IV and higher. Any “open” type of ENC can be used with the apropriate PC-Navigo version, if it is located within the geographical range of that version. It is therefore possible to view (open) “maritime” ENC’s of an area along the Belgian coast with PC-Navigo Benelux, even though it is not situated inland, but it would NOT be possible to view an ENC of the Danube river with PC-Navigo France: both may be in inland waterways, but the version coverage doesn’t match the geographical area. (Unfortunately, many producers of ENC keep their charts encrypted, so that they can only be used with the private software, sold by the same producer. NoorderSoft does not want to take part in such actions and provides whatever chart coverage the authorities make available free of additional charges). The availability of ENC’s differs greatly in Europe: in the Netherlands, Germany, Austria, Serbia and Croatia ENC’s of the main waterways are made available for free: the basic sets of these charts are pre-installed. France and the UK do not seem to provide any public coverage yet, apart from a few experiments that lack accuracy, and Belgium only partially covers the waterways in Flanders. To fill in the existing gaps in coverage and to improve, where necessary, the quality of some poor chart cells, NoorderSoft produced a series of private ENC, which are pre-installed without additional charges in many areas where “formal” ENC are available but needed extra coverage or improved quality: Holland, Belgium, France, and Germany are now fully covered by such additional ENC. 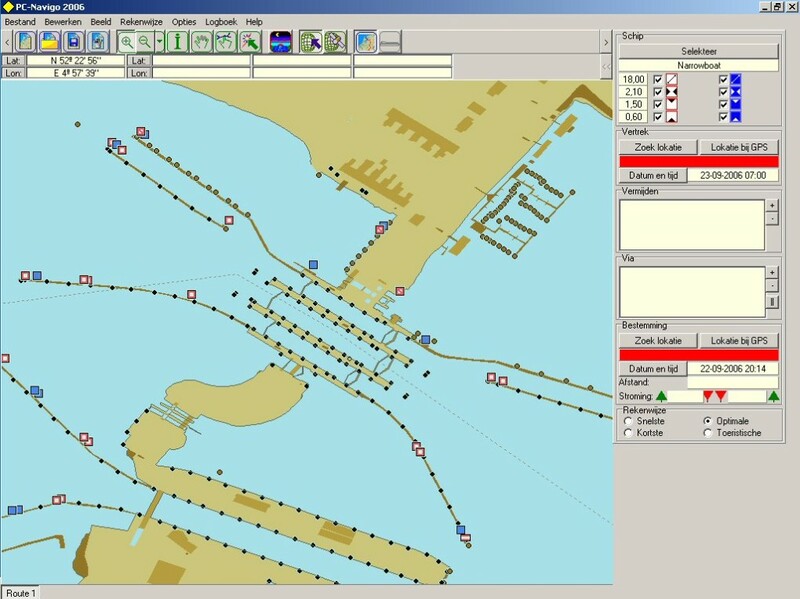 In PC-Navigo all details can of course be shown both in the voyage planning mode as well as in the ENC mode: as before, all detail of locks, bridges, harbours and wharves is shown in the specification screens to the right of the chart. If you don’t need this presentation, you simply switch your PC-Navigo ENC screen to “full screen view”, so that all screen space is reserved for your chart. It’s important to know that the PLANNING information and the CHART data originate from TWO different sources, the waterway database (for the planning data) and the chart cells (for the chart data). This explains the small differences in data that may sometimes occur. For this same reason there may be a difference between the schematic indication of the voyage (the red dotted line) and the position of the navigable channel! Sometimes the red dotted line will be found to be slightly besides the actual channel position. Because the dotted line does NOT indicate a “recommended track” or channel, it may NEVER be interpreted as such! The ENC’s that PC-Navigo uses are distributed and pre-installed in a coherent setting that ensures completeness and avoids doubles. The chart sets can be downloaded from the NoorderSoft servers. Additional charts, whenever they come available, can be downloaded and installed seperately and imported into PC-Navigo. ENC’s can also be obtained from the websites of many waterway authorities, but please bear in mind that overwriting the coherent chart sets provided by NoorderSoft may result in doubles or in lacking coverage! Should you wish to download formal ENC nevertheless, some links are available at www.pc-navigo.com.